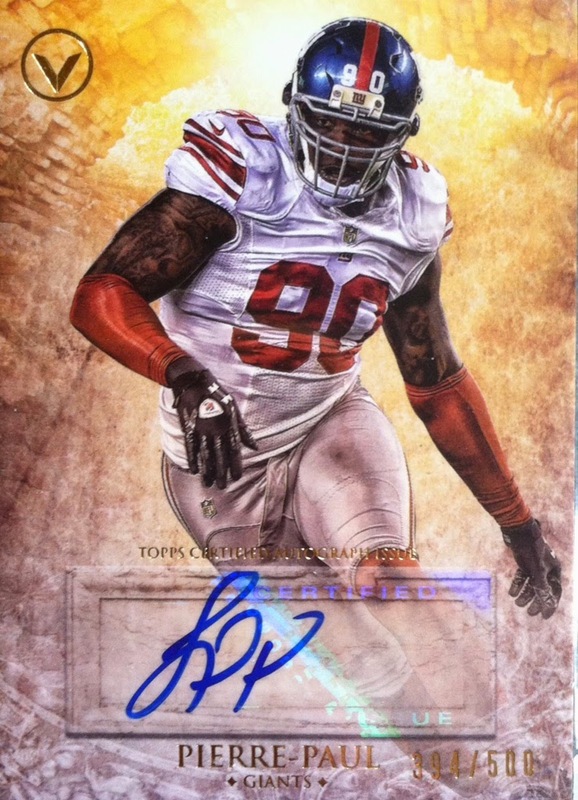 Odell Beckham Autograph....AGAIN??!!?!? SAY WHAT?! 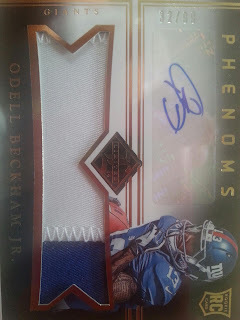 That's right, three days in a row I am posting about an Odell Beckham autograph. I went from zero to three in three days. Today's is brought to you by a Panini Redemption replacement. 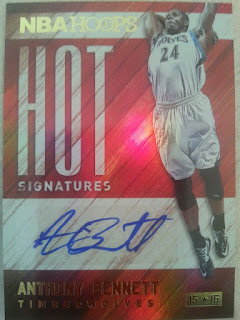 Earlier this summer I pulled a 2014-2015 Panini Preferred Silhouette autograph of Kyrie Irving /35 and I was super stoked. But, knowing it was a redemption, I gave it the four month wait. As cool as I thought it would be to have an Irving autograph, I looked at his potential first. One, he gets injured often. Two he plays behind LeBron's spotlight. Three, he plays for Cleveland. I knew even though it would have been a cool card that I needed to get it replaced with something that would mean more to me. 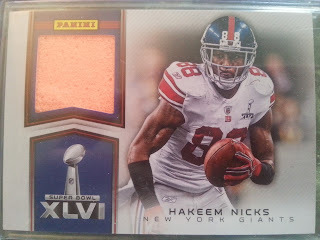 Luckily Panini's awesome customer service helped me out and I scored this beauty! My first true rookie autograph and my first auto/patch of Odell. This was well worth the exchange to me. My team, great player and nice looking card. I am pretty happy overall with no complaints. 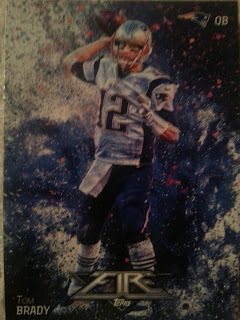 Thanks goes out to Panini Customer Service for the quick exchange rate on this and for letting me choose my team. Contest open to U.S. Residents or those who have an address in the U.S. but live outside it Point being, I can only afford to ship within the U.S. Contest ends on December 5th 2015 with a winner being announced in a different post December 6th 2015. Which is also when the next contest starts! To enter, just tell me your favorite College team to collect in comments below. That's it. Random winner will be selected using Random.Org. Winner will be decided by 7 randoms. This contest is sponsored by me and a due thanks is owed to Tracy Hackler and Panini America too. Card will be shipped PWE. Sport Card Collectors and it's owner will NOT be held responsible for lost, stolen or damaged mail. I will ship it the safest way I can. Good Luck to everyone that enters!! 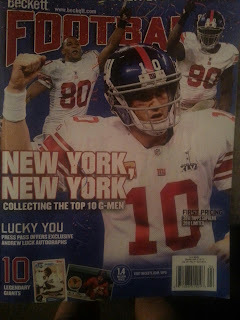 As you can tell, I am very excited about Hakeem Nicks recent re-signing with the Giants on their bye week. It was a much needed signing after Victor Cruz was ruled out for the season. 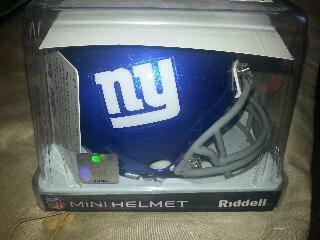 Can't wait to see him on the field today and hopefully catching some passes to help keep the Giants in first place. If you missed it yesterday, I posted Part one of a two-part Odell Beckham autographed card early Christmas gift mail day from my wife. Today is card number two. This one is a beaut! 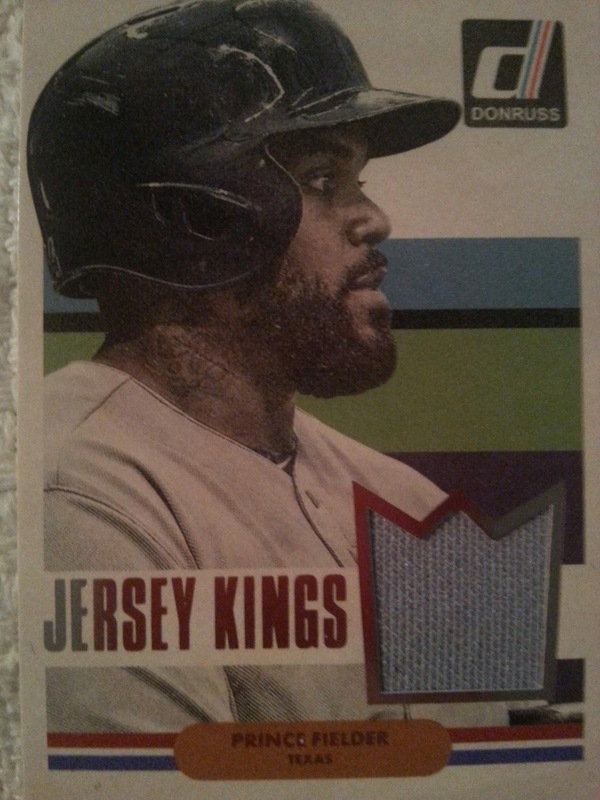 On-card, well designed and no 00 jersey. Hence, I would give it 5-Stars. Yes, really bad pun too. I must have told my wife thank you a million times for these pickups. It feels tremendous to have a top want list card knocked off, especially when you get two of them. There is no way this gift gets topped, I can guarantee it. Before I say, you're always welcomed to leave a comment on my mail day, I just wanted to say.Merry Christmas Eve! Hope everyone has a safe one. 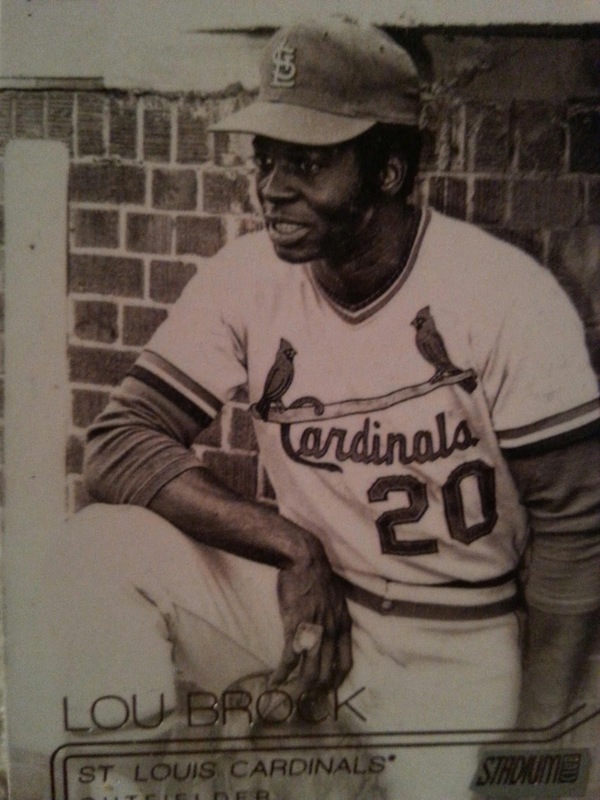 Now if you want to, you can leave a comment on my mail day or let me know what the greatest Christmas gift you have ever received. 3 Weeks Of Christmas Giveaways! It's that time of year where you give back to others, not that I haven't done that all year long, but it's a main focus this time of year. So I wanted to do a three week giveaway with a few cards up each week you can win. Entries will be simple and winners will be random. These contests start Sunday November 29th and will run til December 20th with each winner chosen weekly. Here are the offering of prizes along with maybe some bonuses each week. Depends on turnout. Good Luck to everyone that enters! And Merry Christmas! Were the exact words that came out of my mouth when my wife dropped a big-mail-day-early-Christmas-gift-bomb in front of me. 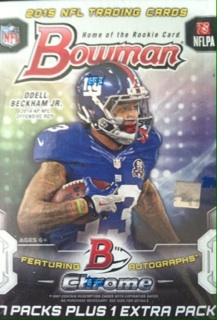 I can finally take an Odell Beckham autographed card off my want list. Actually, I could take it off twice because she picked me up two! She got one amazing deal on them so knowing that it was on top of my Christmas list, she picked them up. 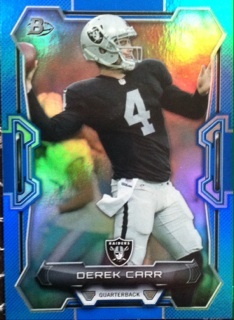 And here is card number one. 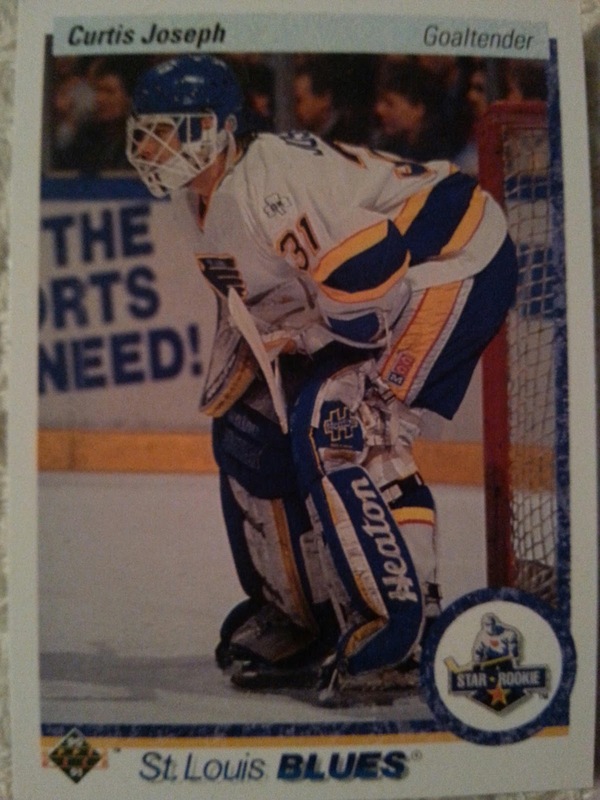 The double zero jerseys always bother me, but other than that, a nice looking card. And here is card number 2.....well...not yet. I will save that one for tomorrow. Wrestling For My Life Book WINNER!!! Thanks for the best turnout I have had yet with my Family Christian giveaways! After 7 randoms, here are the results! You have randomized this list 7 times. Congrats to David P for winning! 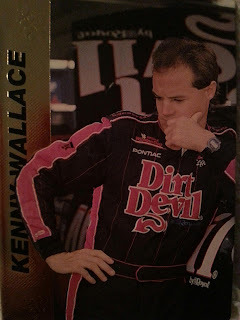 Please email me your address to sportcardcollectors@hotmail.com and I will pass the info onto Family Christian. You will have 7 days from today to claim your prize! Thanks for everyone who entered! More contests to come! Another Happy SCC POD Winner!! I also really appreciate the shout out! Thanks! My 2014 Black Friday Steal! Last year on Twitter, someone sent me a link to Amazon letting me know that there was something on there I would really want. Normally I don't check out links like that, but knowing who sent it, I was fine looking and glad that I did. 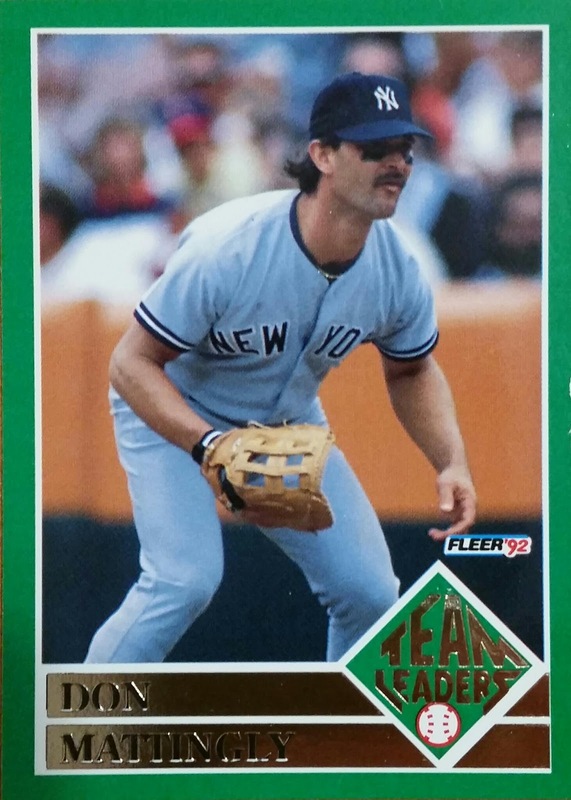 Normally I am not a big memorabilia person as I prefer everything in card form, but looking at it and knowing the $20 price tag, I left a quick subtle hint to my wife and in ten minutes it was mine. Grabbed it just in time to as only two were remaining at that point. 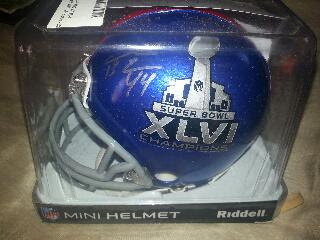 Super Bowl 46 Autograph mini helmet of Ahmad Bradshaw. 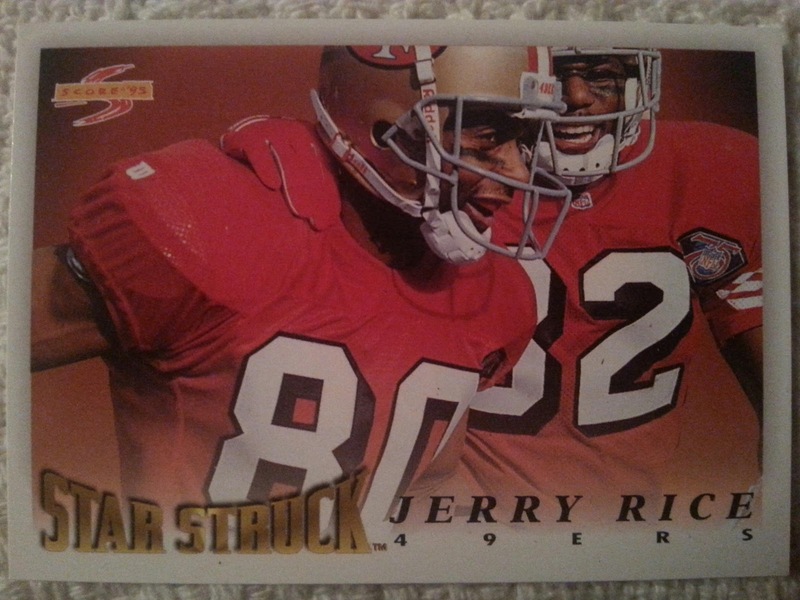 If you don't recall, he was the winning TD in that game. Technically he should had stopped before the goal line lining the Giants up for a last second game winning FG but fell in by mistake. 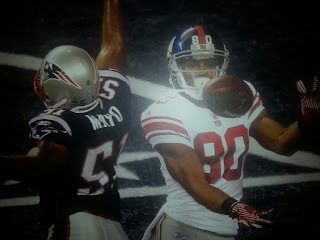 Which I didn't mind, but the Giants barely held on after Tom Brady's Hail Mary attempt at the end. But, they still won and I still cheer on Ahmad because of his big role in the win. 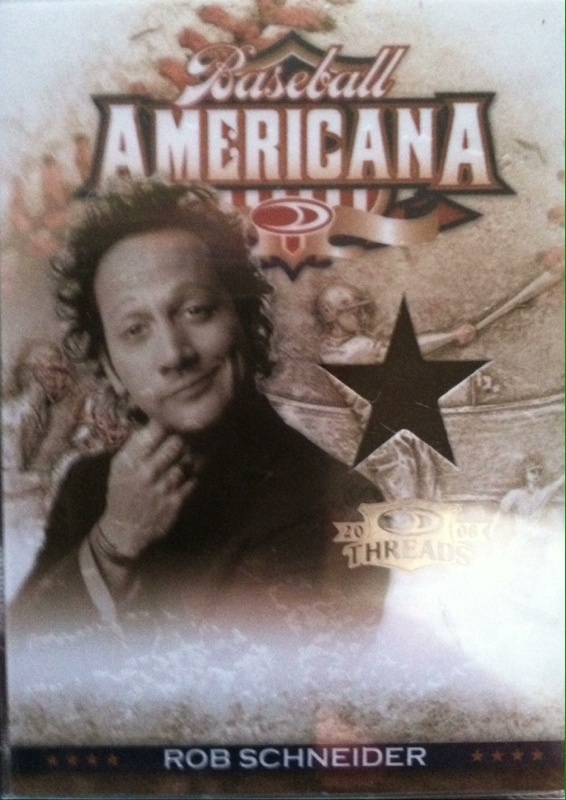 This was by far the best Black Friday pick up for me in terms of my collection. Not sure if I will look again this year or not. 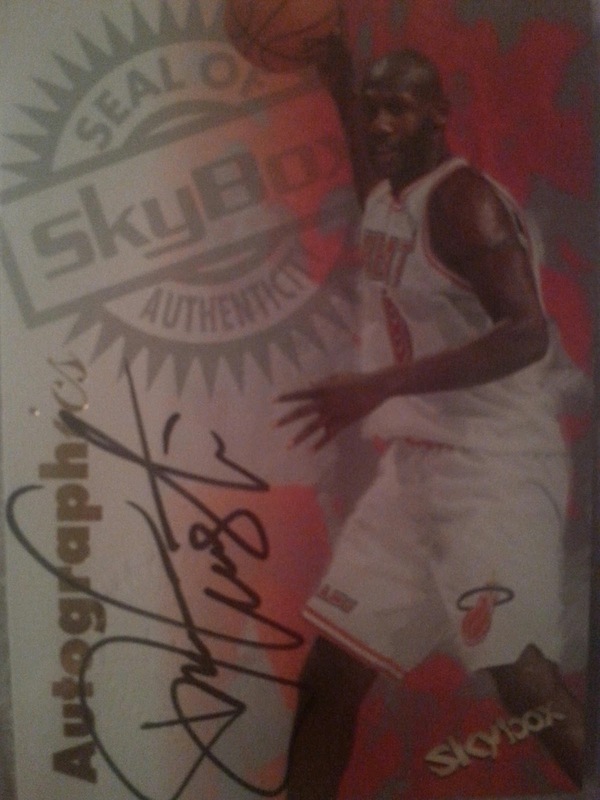 What's the best steal you have gotten on Black Friday for your collection whether it's cards or memorabilia? I just wanted to wish everyone a Happy Thanksgiving! Spend today being thankful for everything in your life. Even the smallest things deserve a thanks. I know I am thankful for God, family, house over my head, food on the table, this blog, you guys, the hobby and life in general. It doesn't seem like much, but this is the very first card I posted on here (same pic too) that kicked off Sport Card Collectors. Without this blog I wouldn't have been able to see the hobby in a new way that has expanded my interest in it even more. What's the one card you are most thankful for and why? This card is crying out for a Caption. My patience with redemptions is very thin, I can usually only make it the four months before I require a replacement no matter what the card is. I would rather have something in hand than nothing. 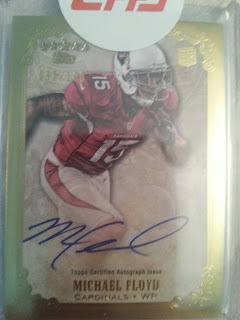 A 2012 Topps Five Star rookie autograph of Michael Floyd. It's a fair replacement in my opinion. 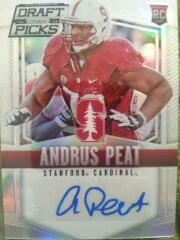 I miss out on a Giants auto, but I get a rookie auto for the PC. 50/50 to me. 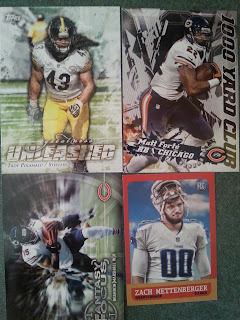 Thoughts on this mail day or your Topps redemptions you know where to leave em! I did a similar poll to this one back at the end of June to see which of my segments is most popular.With some newer ones in place, I decided a second poll was in need to see if opinions on some had changed and found out that they had. The first time the results were pretty even across the board, this time they are much different with a few surprises to me as I see the views on my end. Let's take a look at this round and see how the segments fared. Then you will get my thoughts on it. What's In The Box finishing at the top spot wasn't much of a surprise. It was my highest viewed series. The sad part is I had to end it as I showed off all of the contents. Mail days coming in second was a bit of a surprise. My mail days are more top eight than second. The more highly viewed Hobby Topic finished in the middle of the pack and third best viewed Caption This! never got a vote. I guess people don't enjoy captioning the cards as much as I do. Another top 5 in views on my blog is This vs That which nailed only three votes. Breakin Wax and my Reviews always score high but I was a bit surprised my opinion stories failed to only get two votes. Guess a lot of you don't agree with my thoughts lol. Newcomer Reminiscing 90's did well, but 90's Flashback did even better despite being on the lower end of being viewed. Weird how things worked out. Let me know your thoughts on these and which one is your favorite! WINNER Of The Victory Fine Arts Print Giveaway!! I apologize about the delay today on announcing the winner today, but I wanted to hear back from Victory Fine Arts before I announced the winner so I know where to send their info. I still haven't heard from them yet and didn't want to delay this any longer, but will lead the winner in the right direction on who to contact. So without further ado, one of you will be lucky enough to take home one of these amazing prints. BIG CONGRATS TO Scott on pulling home the win! Please email marie@americanpopdigital.com or contact @VictoryFineArt on Twitter on how to claim your Kobe Bryant print you commented about. You will have 7 days from today to claim your prize or I will give it to the second name on this list. Thanks to everyone who entered especially those who spread the word on the contest. This was a fun one for sure and maybe Victory Fine Arts would like to do this again in the future. DO NOT MISS OUT ON THIS!! Win a Victory Fine Art Sports Print of YOUR choice! Just follow the link below for details and how to enter! CONTEST! 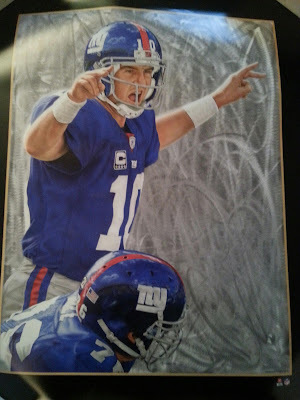 WIN A Victory Fine Art Sports Print!! 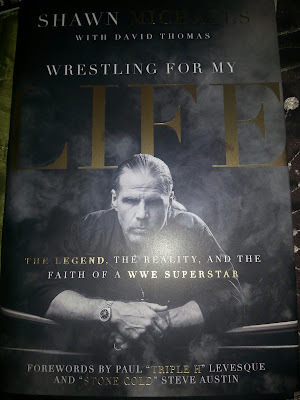 Wrestling For My Life Book Review And GIVEAWAY!! For those of us who like to read and may be feeling a bit down, a faith based book as Wrestling For My Life is a key pick-me-up. When you think of Christian athletes you hear names like Russell Wilson and Tim Tebow, but did you know that Shawn Michaels is one as well. I didn't. That alone was a reason to pick-up this book as I was intrigued by that thought. I always look at wrestlers as mean as they come but there is another side of them. In Wrestling for My Life, Shawn Michaels opened up about his days in being in the WWE and the many different struggles he went through. He began the book by sharing how he became addicted to pain pills after suffering from extreme pain from his injuries in wrestling. He admitted that some days he took up to thirty-five pills a day. Which you would imagine from the hits, trips and falls they take that some would be needed. But, obviously that amount is a bit much. His wife, Rebecca prayed daily that God would come rescue her husband and set him free. That moment came when his two year old son, Cameron crawled up on him while he was resting after taking a few pain pills and said, “Daddy’s tired”. Sometimes even the littlest things can lead you in the right direction. Especially if it involves your kids. Shawn then was led by the Lord to find a local church to attend in Cornerstone. He began to increase his knowledge in God by joining in on a Bible study group as well and surrounding himself with supporting Christian friends. Soon enough he was led to salvation by asking Jesus into his heart and was saved. After doing that, his life began to change as the addiction went away and he began to work in a Christian ministry working with various Churches, charities and organizations. It's simply amazing how God can turn your life around when all you have to do is find Him. Sometimes He finds you in amazing ways like with Shawn and through his son. There is a lot more to this book that I won't give all away including an amazing photo gallery in the middle. I would recommend this book to everyone. It's a great read from cover to cover and to see the changes that God made in Shawn's life was amazing. I will say however if you like Wrestling, hunting, family and faith, you are covered here. Now thanks to Family Christian, you guys can too own a copy of this book. In the comments below, I want to know who your favorite Christian athlete is. That's it! Contest ends on Wednesday November 25th 2015 with a winner being announced here in comments on November 26th 2015. Good luck to all that enter and God bless! 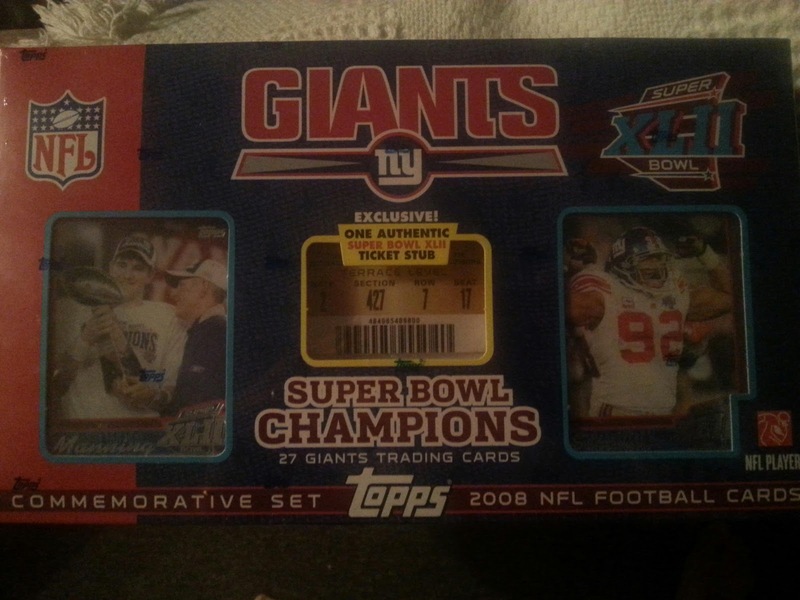 2 Rack Packs For $1...SAY WHAT?!?! Yup, you read it right. I paid $1 for these two rack packs. How? Well, every year on my anniversary, Olympia Sports sends me a $10 use-as-you-wish gift card. Usually, I use this card to buy cards and spend as little as I can in real cash. This year I was able to pick up two rack packs for roughly $11. So you take $11-$10 they gave me and I spent $1. Good deal! Now onto the rack packs. I got a 2014 Topps football and a 2015 Topps baseball. and rookies weren't much better except for these two. Other than that, pretty lame break. 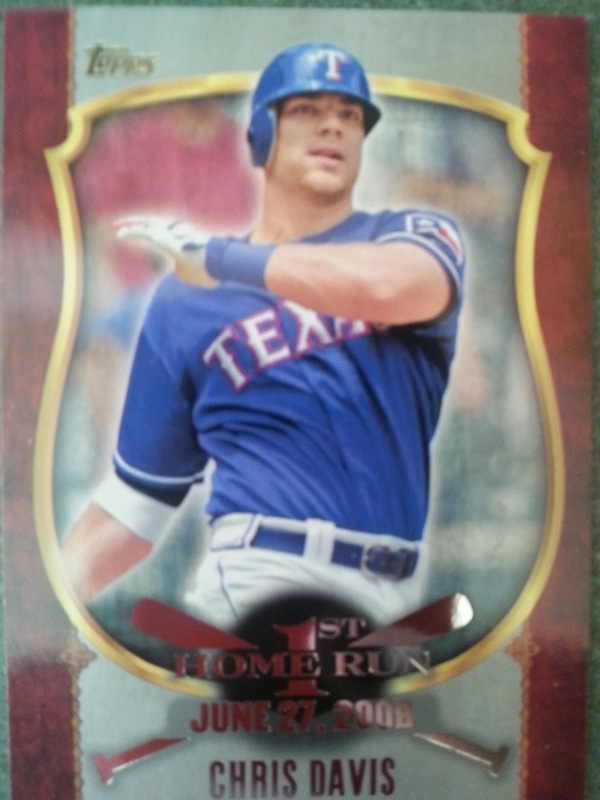 The 2015 Topps baseball provided me with a little more. It was by far the more valuable pack between the two. 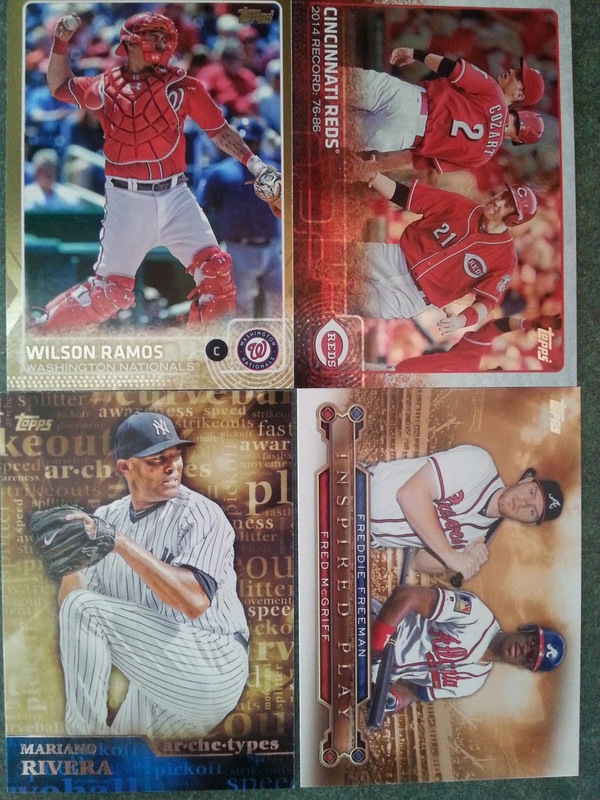 A foil insert, numbered gold card and a Mo Rivera. Nice! 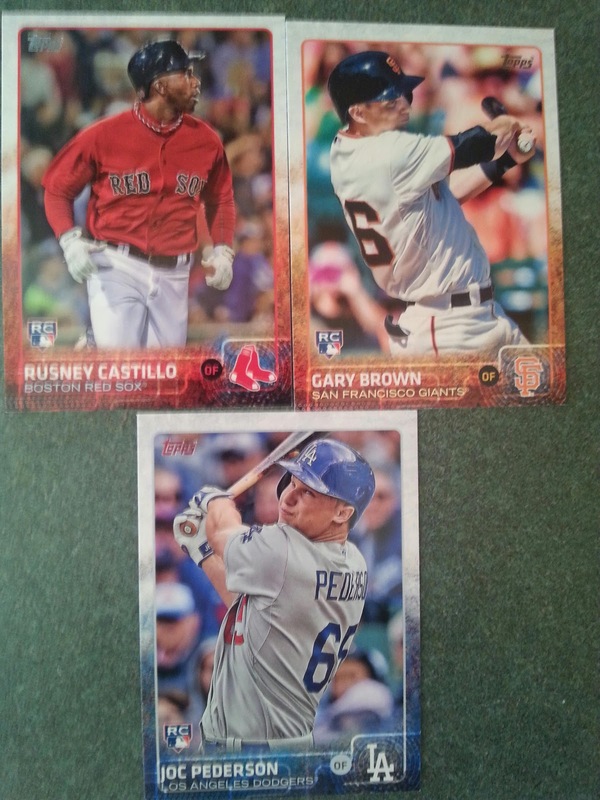 And some great rookies including a Rusney and a Pederson, both of which I didn't have much of. 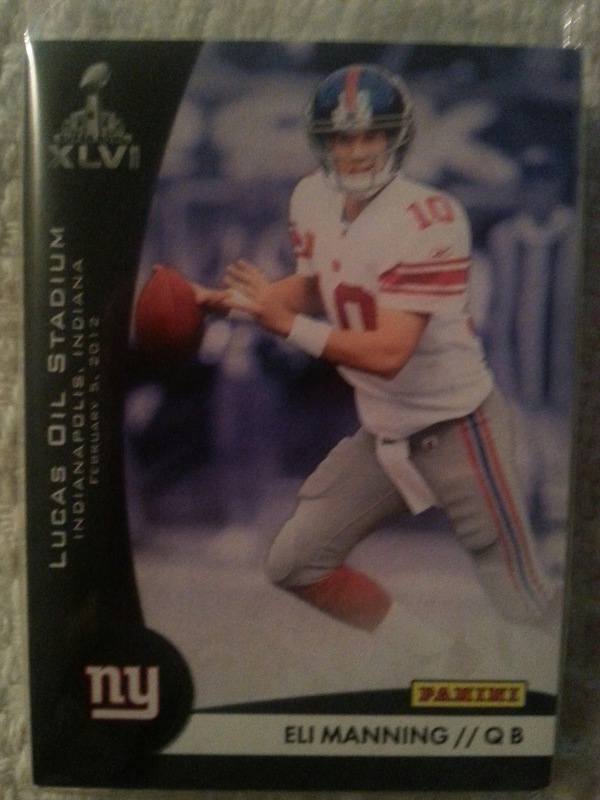 Not a lot of big time pulls here, but for a $1, you can't really complain. It's Time For Giants vs Patriots Again! Call today's game what you will, but when the Giants and Patriots match-up, according to the last four games, this will be a doozy. My hatred towards the Patriots has been long standing and you would think they were apart of the NFC East, but they are not. I just don't know what it is about them, the coach, their QB, their continuous winning*, the fans I know, whatever it is, I root against them all of the time. 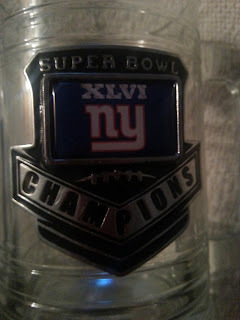 So it always makes things more interesting when my Giants play them as I have many friends and family that are die-hard Patriots fans. 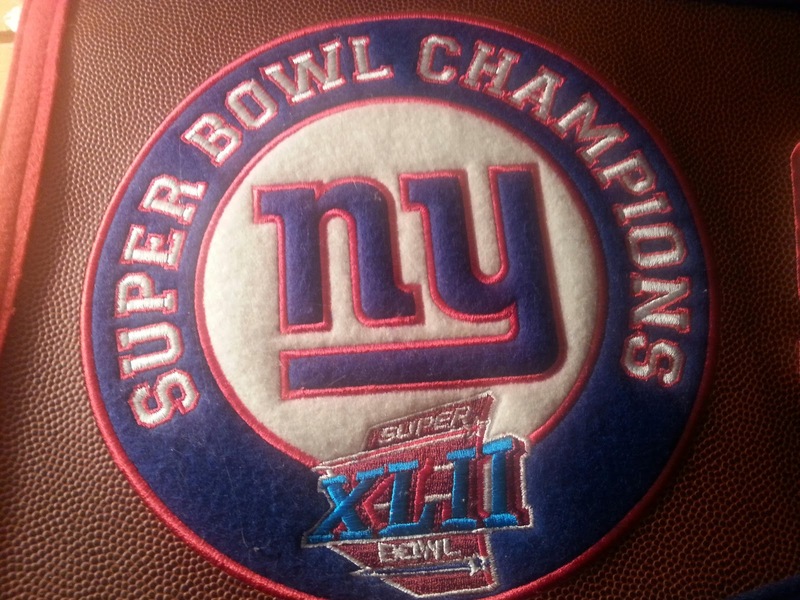 Luckily I have had the upper edge in the last few face to face games as in the last four match-ups, not counting the preseason, the Giants are 3-1 against them including two Super Bowl wins. The one loss, the Patriots final game in their 16-0 season. A game I will say the Giants had until late third/fourth quarter. But, that loss was okay, it built momentum to a Super Bowl 42 win so I will take it. 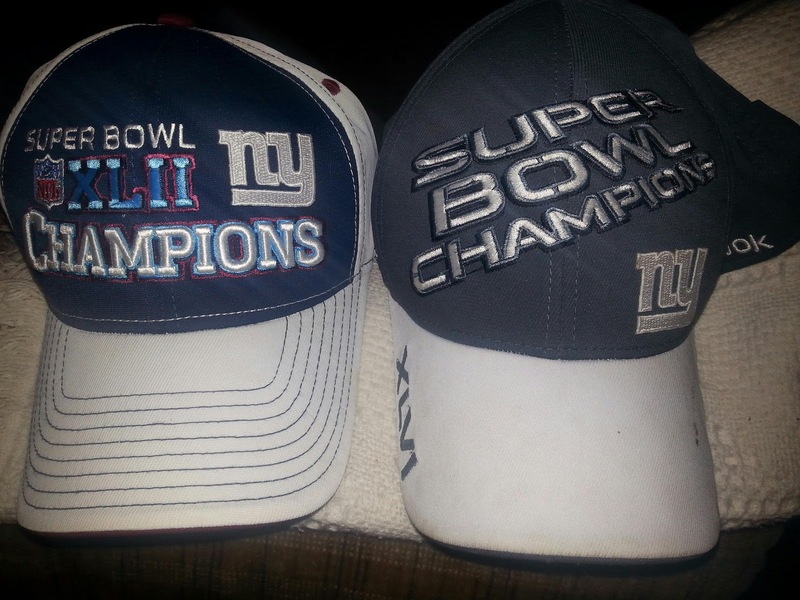 As you will see, I get a tiny bit excited about a Super Bowl win against them (sadly this is only a few items). My favorite set of them all, I have two copies and would def take more. 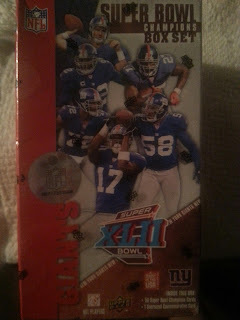 Real Super Bowl ticket stub!! However, since their last match-up, the Patriots have continued on winning was as the Giants have fallen from grace til this season as they are in first place in the ugly NFC East. 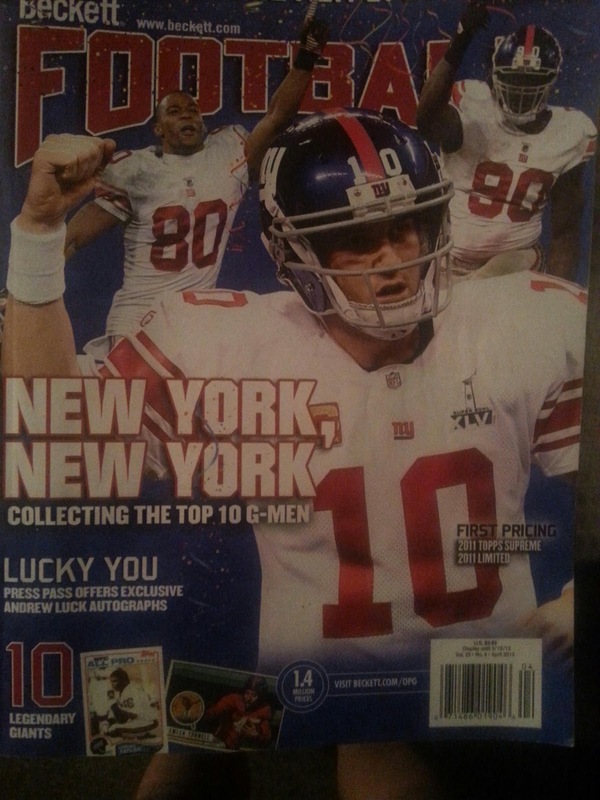 This season the Giants are winning against sub-par teams, besides the big Buffalo Bills road win. How will they fare against an undefeated powerhouse like the Patriots? I am not sure. I do know the key to beating the Patriots is not stopping these two, but slowing them down. If you can do that, you give yourself a chance. The only issue with that for the Giants, their horrific defense. It's not even close to the one that beat them the last few times. I think the key is this guy who made an impact last week, but will have to be a firework on defense to help slow down the Pats. What's my prediction for this game, I think the Giants will put forth a great effort, but unless I see massive improvement from their injury riddled defense, it will be hard to beat the Patriots. So I will say 31-20 Patriots as painful as it is to admit, but not being able to slow down Gronk will be the main reason. 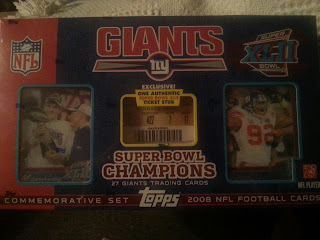 But, I won't fully count out the Giants as a possible threat to them and their undefeated season. And obviously I will be cheering hard! Let's hear your predictions for the game! 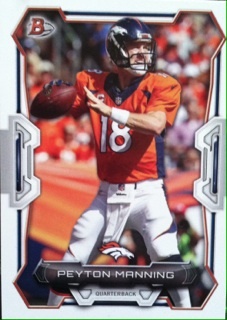 So I broke down and did it, I bought a 2015 Bowman football blaster box. As you know I have shared some strong opinions on the product as it is a shameful put out of what it once was. With the circumstance of wanting to bust something and my Walmart carrying no other options, I gave it a go anyways. Here is how it went. 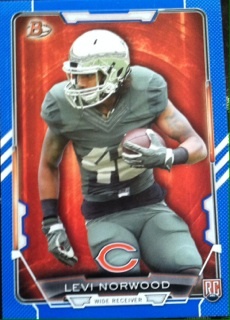 In every blaster of 2015 Bowman football, there are eight packs and seven cards per pack. Blasters run you about $20. There are no guarantees on hits. I also haven't figured out why companies put seven packs plus one extra pack when you know all along they were packing eight packs in there no matter what. The base cards are not terrible looking. A lot of border and paper thin card stock, but not too bad. 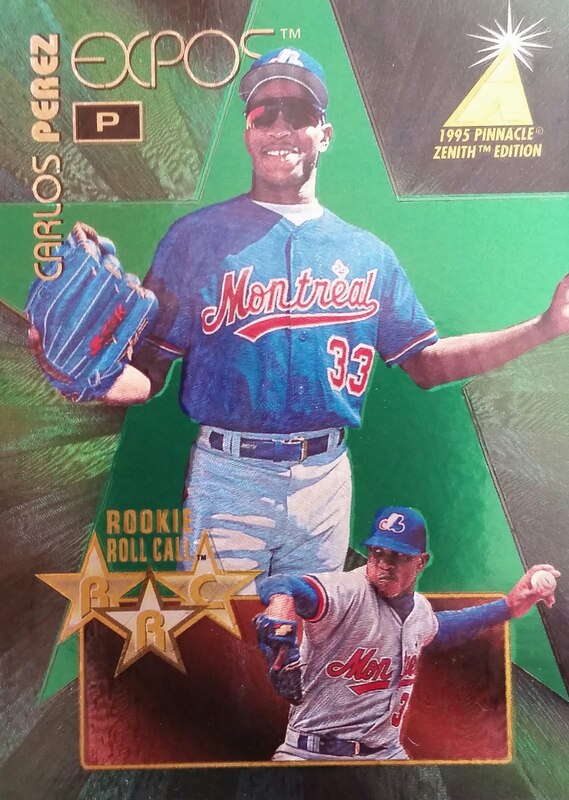 This is the biggest eye sore of the product, the rookies. 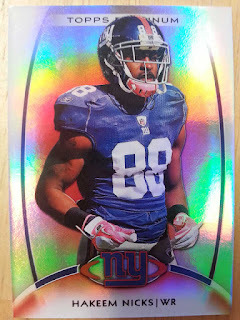 No logos, the background colors are atrocious, and I just don't think they have any appeal. 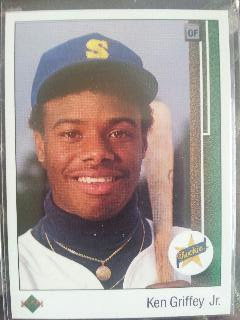 I remember when Bowman put out solid full-bleed color photos for their rookie cards. What happened??!?!? Oh, these were the best two rookies from the box. Purple parallels. Not bad players and I think Petty has a bright future. 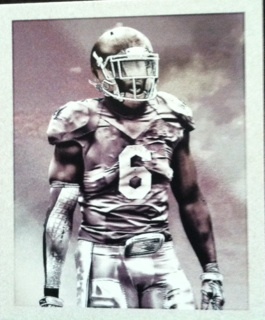 These look pretty sharp. This kinda card I don't mind. 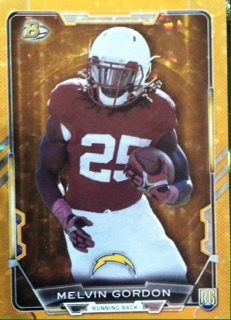 And my best pull from the box an Melvin Gordon Orange Ice numbered to 50. And to finish it out, a Mini. 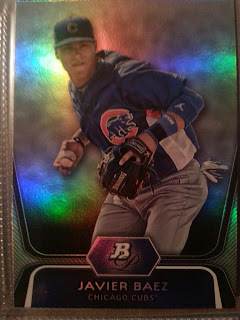 Overall, there was a mixed feeling on value in the blaster. My rookies weren't great, the parallels were mostly easy/less valuable pulls and as you can see, the Gordon was the best card. 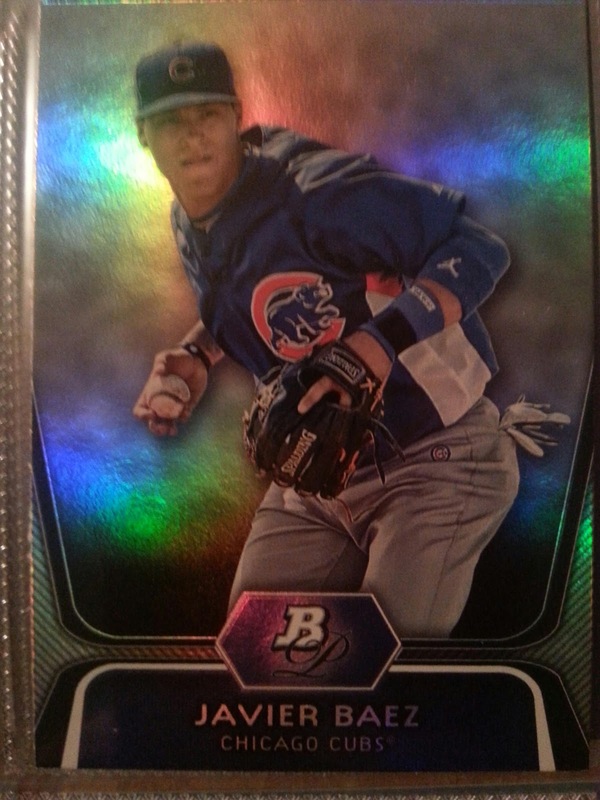 With the feel of the product combined with the value I felt I got in this blaster, it feels Bowman won't be missed next year by me and won't be picked up this year by me again either. "Jake The Snake" Autograph Add! WINNERS Of The Main Player Of The Day Contest! WINNER Of The World Series Contest! 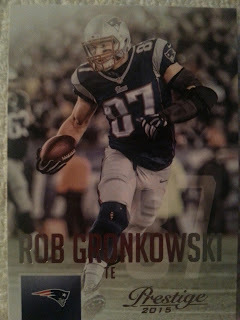 Winner Of The Second Round Of Panini POD Packs! 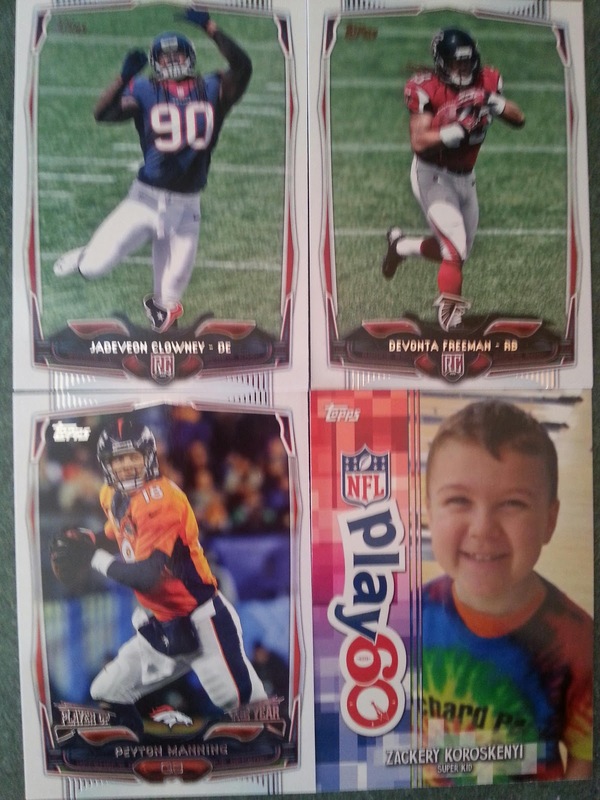 Kids Photo's In Player Of The Day Kids Promo! Ain't Nobody Got Time For Cardboard! Formally Sport Card Collectors Blog. Been blogging Since March 1st 2012 Been collecting since 1994 and love sharing the hobby with others.